UNESCO (United Nations Educational, Scientific and Cultural Organization) is an organization that helps strengthen ties between nations and societies by coordinating international cooperation in education, science, culture and communication. For a global network of dedicated professionals, ensuring clear, effective, and simple communication and collaboration methods is the lifeblood of their operations. 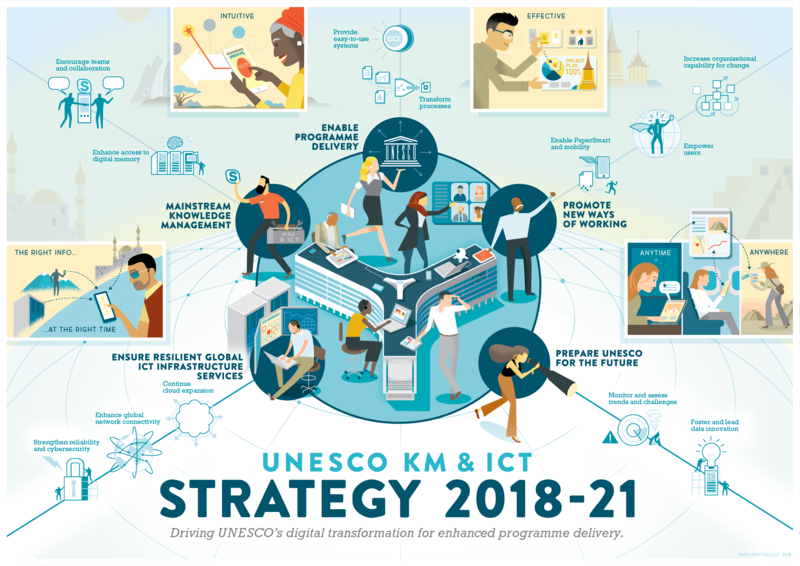 UNESCO’s Knowledge Management & Information and Communication Technology group (KM & ICT) sought to renew its 2018-2021 strategy, focusing on a digital transformation to optimize the usage of their technological development services and designing “future-proofing” initiatives to ensure relevance in today’s competitive business ecosystem. Overall group goals included revising their strategic direction, alignment of team ambition level, and identifying key projects to focus on in the future. Territory’s approach to guiding the KM & ICT group involved performing research to understand key changes and challenges that UNESCO was undergoing. Dynamic engagement components were created to evaluate the team’s current strategy, and pinpoint key stakeholders. A two-day workshop held at UNESCO’s Paris office helped gather insights from users and key stakeholders to identify and clearly define the team’s goals, objectives, and direction for the new strategy. The team then brainstormed with participants of the workshop to determine which elements of their current strategy should be carried forward, and what should be revised. The guided collaboration illustrated to team members where their priorities should be and what to highlight in their renewed plan. The results of Territory’s efforts at UNESCO was establishing a clear and easily understood strategy that the KM & ICT group could use in the future, and that would be widely shared among stakeholders. To increase global awareness and understanding as well as improve simplicity for sharing among stakeholders, an illustrated depiction of key strategic directions and desired impact for UNESCO was created. The poster illustration also served as a visual reminder for the KM & ICT group to track their progress and remain focused on their goals.